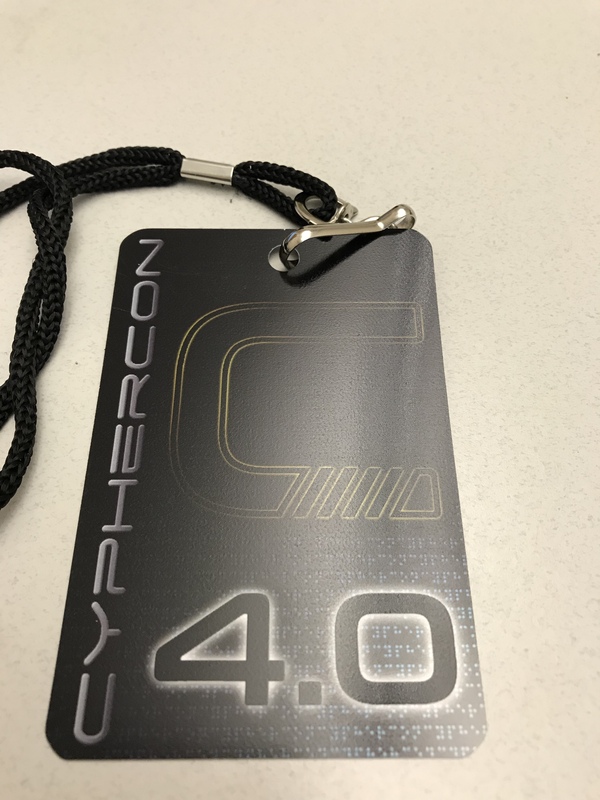 Taught my morning class today and then walked over to the convention center (maybe 20 minutes away) to attend CypherCon, billed as “Wisconsin’s Hacker Conference” mostly centered on network security but also containing bigger-picture sessions on societal implications of data breaches. A big term I heard across sessions was “weaponized.” Like, what happens to all the data gained by bad actors when a database is breached? How might that be weaponized against us individually? How might other governments find a way to turn that data into a weapon against us as a nation? Or, even in the absence of a database breach, what happens to us when all the data is that we willingly give to BIG DATA companies (you know which ones I mean) is joined with other data we don’t even think about being collected on us (every single one of our credit card purchases, all of our internet search histories, our medical data which is anonymized but can easily be reverse engineered to identify us using info from public domain databases), along with all the data we may not even recognize as such that is collected by voice-activated assistants in our homes and offices and soon (if not already) our vehicles—what happens if all that data is “weaponized” and used against us? So yeah, a really interesting conference to attend even though I’m not a hacker or a network security professional. As a college professor developing background expertise to teach a social science course on “digital society,” I was able to find connections in almost every session I attended. Even when I didn’t totally understand the ins and outs of technical presentations, I still learned new things that should be helpful in some way I don’t see yet. It was a beautiful morning, if windy, so I decided to walk over to the convention center instead of taking a cab or Uber. 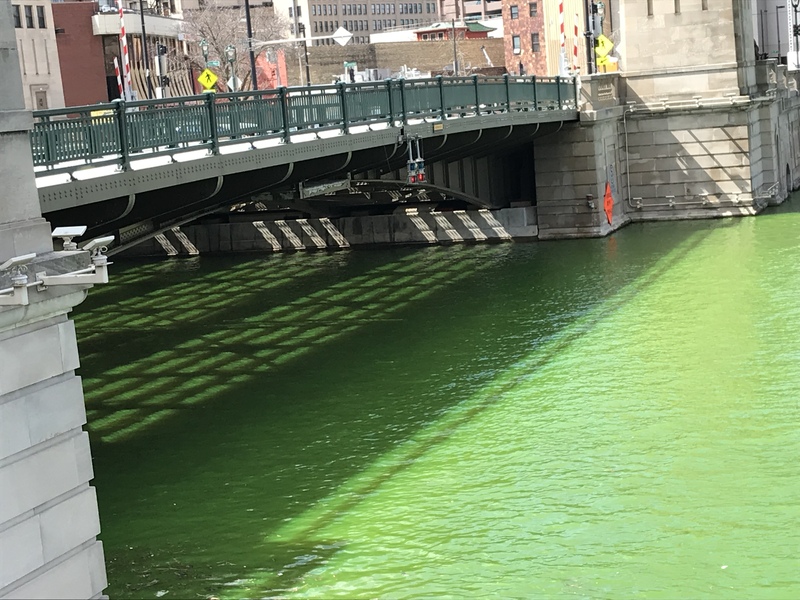 Thus, I was able to see our Milwaukee River dyed bright green in support of the Milwaukee Bucks’ entry into the playoffs. 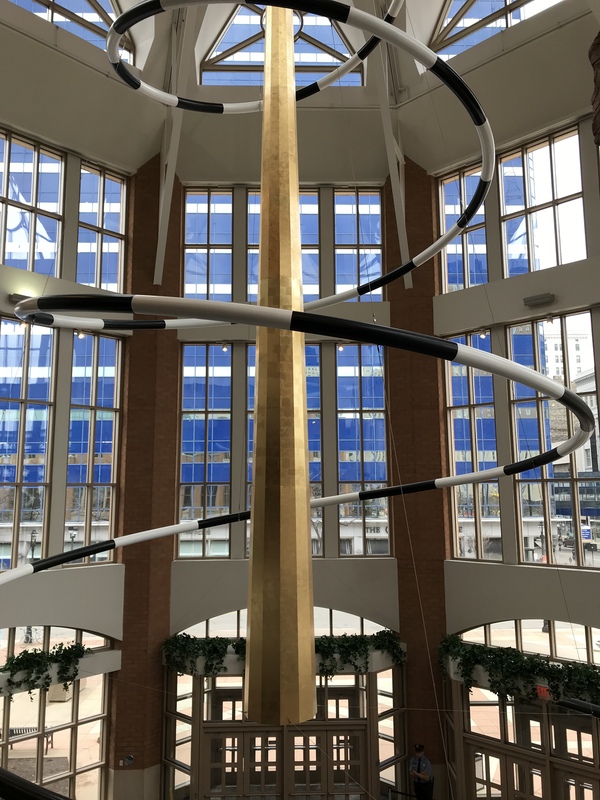 Took this photo of the convention center’s atrium mobile/chandelier/sculpture hanging-from-the-ceiling thing just because I liked the swirling lines against the grid of windows and the blue on the building across the street. The walk back to my office wasn’t nearly as cheerful as the walk over. The sun had vanished, the sky was gray, and boy was it windy! Plus, I walked a slightly different route that took me past the Bradley Center. Or what’s left of it. I’ve lived in Milwaukee long enough to remember when the Bradley Center was brand new. I also took this panorama showing the new Fiserv Forum right north of the partially-demolished Bradley Center, which itself is right north of the old MECCA, where the Bucks used to play before the Bradley Center. It was sort of cool when I looked at this photo back at my office and realized I’d unwittingly captured all three of the Bucks’ homes side by side in the same picture. Actually the old MECCA has found new life as the home of the UWM Panthers basketball team. I wonder how long Fiserv Forum will last before it’s considered too small, etc., to be acceptable? The useful life of a professional sports arena seems to get shorter and shorter. This entry was posted in architecture, Art, Life, Milwaukee and tagged Bradley Center, Cypher Con, Fiserv Forum, Milwaukee, Milwaukee Bucks, Milwaukee River. Bookmark the permalink. That sculpture of the security guard is so realistic!